Whistler is a small town north of Vancouver in the British Columbia province of Canada. It's famous for having one of the largest ski resorts in North America and for hosting some of the events of the 2010 Vancouver Winter Olympics. Check out the Tourism Whistler website for more information. The town is surrounded by two mountains: Whistler (2,184m/7,165ft) and Blackcomb (2,436m/7,992ft). There are over 200 marked ski trails in between the two mountains, catering to all difficulty levels: green for beginners, blue for intermediate, black for advanced and double blacks for people who are just plain mad! #1 WHISTLER PRIDE PARADE: skiing with pride! Let's start with the basics, the skiing. It's pretty damn awesome here. Why? Whistler boasts one of the best yearly snow conditions, receiving an annual average of 11.7m (38.4 feet), so you're guaranteed an excellent ski season during the winter months. In addition, the whole town becomes one large skiing community, with public shuttle buses, excellent chalet style lodgings, a variety of après ski events and more. It's no surprise why Whistler is consistently voted as one of the top resorts in North America by major ski magazines like Snow Magazine and SkiMag. One of the best things about the Whistler Pride festival is the parade. We started at the top of a green slope, giant rainbow flags to hand, then skied all the way down, continuing through the centre of Whistler town, with a fun large crowd growing alongside us by the minute. 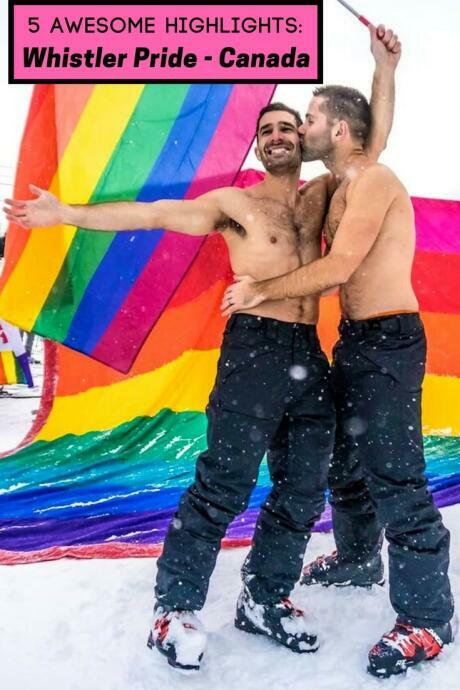 We've been to many pride parades during our travels, like the gay pride in Montreal and Puerto Vallarta to name a few, but never have we been in a gay pride parade which involved snow and skiing. It's unique, unreal, loads of fun and definitely worth checking out. There are many different Whistler Pride events taking place, which are reason alone to come. Every day we had a happy hour cocktail at the gay après ski with our group. Then after dinner, there was a large party taking place, which would go into the early hours of the next day. The Whistler Pride pool party called Splash was our favourite. Imagine partying with a group of gay boys in Speedos, splashing about in a large pool, with live music, disco lights and of course, the obligatory pink flamingo floats. Other fun Whistler Pride events we loved were the Furrocious fetish party, the Snowball closing party and the comedy night featuring the hilarious Margaret Cho. She was absolutely brilliant and completely brought the house down. There are many activities you can do at Whistler alongside skiing and ogling speedo-clad guys at the pool party. One of our favourites was riding a snowmobile through thick piles of snow, in a scenery completely white, everything completely frozen over. We rented a couple of snowmobiles and did a guided tour with Tag Whistler. We went away from all the crowds of skiers into untrodden paths, which you can only access with a snowmobile. It was just us powering through this white paradise – a truly unique feeling you can't beat. What inevitably happens when the gay boys hit the snow? After a full day of skiing, we were craving a spa session. We were recommended by many locals the divine Scandinave Spa. We can see why! It's stunning here, beautifully decorated with a mix of outdoor cold/hot baths, relaxation rooms, saunas and steam rooms. There's also a strict silence policy in place, so no chatting, and absolutely no phones allowed! Definitely a place to check out in Whistler. #5 PEAK 2 PEAK GONDOLA RIDE: cure your vertigo! The Peak 2 Peak is a tri-cable gondola lift that links the two big mountains. It goes between the Roundhouse Lodge at Whistler Mountain to the Rendezvous Lodge on Blackcomb mountain. The cabins hang as high as 435m/1,427 ft, travelling nearly 3.2km/2miles without passing a single support tower. Not the place to come if you suffer from serious vertigo! Skiers use it to access new trails across the two mountains. For non-skiers, the Peak 2 Peak Gondolas are a sightseeing highlight in Whistler. The views from above are just stunning – everything below you covered in a blanket of snow. Whistler Pride 2019 dates: the 27th Whistler Pride week will take place on 20-27 January. How to buy tickets: book on the official website for the latest deals for hotel packages and more. Where to stay in Whistler: the Aava Whistler hotel is the official Whistler Pride hotel. For a more romantic experience, we recommend the Summit Lodge Boutique Hotel, which is where we stayed, and absolutely loved it. Whistler gay bars: there are no gay bars or clubs in Whistler. However, every place we visited was extremely gay friendly and welcoming to us. How to get to Whistler: Vancouver International Airport (YVR) is the closest international airport, 135km/84m south. Driving time to Whistler from Vancouver is around 2-2.5 hours along the scenic Highway 99. You can also fly in to Seattle or Bellingham airports, then transfer to Whistler from there. I”m glad it might be useful one day. There are also some excellent high end restaurants in Whistler with lots of locally sourced ingredients. You will enjoy eating your way through Whistler!